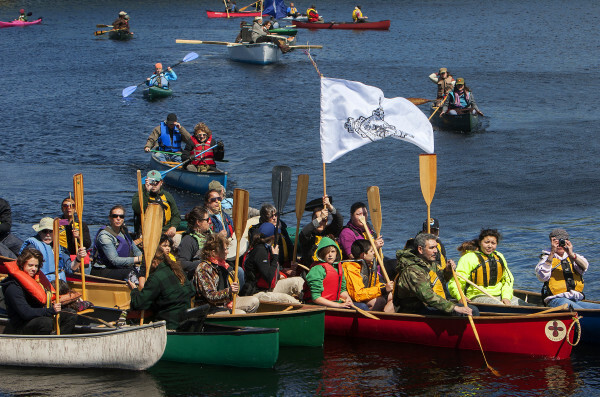 Kayakers and canoeist take part in a flotilla on the Penobscot River in Bangor, May 23, 2015. When I was growing up, manifest destiny was a concept we learned about with pride. The Americans — which we now recognize meant white Europeans — bravely made their way across the continent, turning this wild land into a great country. We learned about Thanksgiving Day as a blissful time of harvest and harmony. We learned about agreements made between the people who lived here, indigenous people, and the new people, mostly white Europeans. Those agreements were called treaties, we learned, and all people involved had a say in the creation of those agreements. On the other hand, we also were taught that white people came to this land and rounded up the native people and made them live on “reservations.” We learned about smallpox blankets killing many native people, and we knew the white Europeans did things that were unfair. I certainly remember feeling that familiar “white guilt,” knowing my ancestors may have played a part in the destruction of ancient cultures, knowing that we white people tricked and lied to and murdered Native Americans. Most people I know today recognize that Columbus Day doesn’t feel like something we should celebrate, as though “Columbus discovered America.” We either take part in awareness events or feel sort of sick to our stomach about the whole thing and enjoy a day off of work. That’s the reality. So, maybe we’re a little bit more informed. But, what I didn’t realize was that we, the people of the state of Maine, are still trying to take territory away from the people whose families have lived here for more than 10,000 years. The white people are still breaking treaties and still trying to steal from the Indians. The state of Maine is — we are — trying to tell the Penobscot Indian Nation that their reservation, which includes more than 200 islands, does not include any part of the water around those islands. Let me say that again: We are trying to tell the Penobscot people, an ancient culture built on subsistence-level fishing, that their territory does not include the water surrounding their islands. There is a lawsuit that is getting a lot of attention that’s related to this issue; it is about the Penobscots and the Penobscot River. Gov. Paul LePage is trying to tell the EPA that the state of Maine shouldn’t have to keep the river as clean as the EPA says we should. The racism and ignorance of that situation is dire and disgusting, too. But it’s not that case that gets down to the most critical issues about the Penobscot Indian Nation and the Penobscot River. We need to tell our elected officials across the state that we don’t want to steal territory from the Indians anymore. Personally, I want to grow closer to the harmonious bliss of the fictional Thanksgiving Day tales of our childhood. We should let our elected officials know that we non-Penobscots don’t want steal the river of the Penobscot people.